Are you eligible for unemployment benefits if you quit your job? The answer is complicated and depends on the reason you quit. In most cases, if you quit your job voluntarily, you will not be eligible to collect unemployment benefits. But there are exceptions. 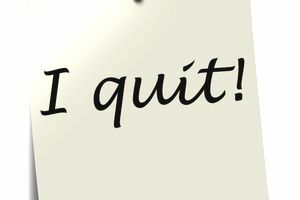 If you quit for what is known as “good cause,” you may be eligible. Also, since unemployment programs are administered by states, your eligibility may vary depending on where you live. Bottom line, if you plan to rely on unemployment benefits while looking for a new job, you should research your eligibility before you take the irreversible step of quitting. You don’t want to find yourself in a bind financially while you’re job searching. Unemployment benefits are intended to bridge the gap between one job and the next, providing workers with monetary payments until they find a new job – or at least, for a period of time determined by the state they live in. Each state determines what constitutes good cause to quit. These benefits are intended for workers who suffer an unexpected loss in income due to layoffs, or in some cases, due to being fired. In most cases, if you quit voluntarily, you are not eligible for these benefits. However, if you resign for good cause you may be able to collect unemployment benefits. There are many valid reasons to quit a job, such as a lack of advancement opportunities, poor hours, or tedious responsibilities, which do not meet the legal definition of "good cause." Some types of family emergencies are also considered good cause. Good cause is determined by your state unemployment office, and it varies from state to state. For instance, some states consider quitting due to a spouse's new out-of-state job as good cause, while others only consider that good cause if the move is due to a spouse's military transfer. When you file for unemployment, you will be able to make a case for why you are eligible for unemployment benefits if the employer contests your claim. If your claim is denied, you should be entitled to a hearing where you can plead your case. If you are planning to quit your job and you are not sure whether you're eligible, check with your state unemployment office to determine your eligibility for unemployment compensation prior to announcing your resignation. They can help you to assess your case for claiming good cause. If you have filed an unemployment benefits claim and your claim is turned down or contested by your employer, you have the right to appeal the denial of your unemployment claim. As with filing for unemployment generally, the appeals process differs depending on where you live. Consult your State Department of Labor for guidelines on appealing your unemployment claim denial. Be prepared to collect supporting documentation, find witnesses, and continue filing for unemployment while you appeal. Also, be aware that timing is key: in some states, you have as little as 10 days in which to file your appeal. If you have questions about what your state regards as good cause, your state's unemployment office is the best resource. While their websites have a great deal of information, a phone call is often the best way to get a clear and definitive answer to your questions. Are you planning to resign from your job? There’s a right way and a wrong way to quit. Weighing your options before you quit. Evaluate your job to be sure that leaving is really in your best interests. Do you hate your job, for example, or just one aspect of it? Could small changes like telecommuting a few days a month make a difference, or are you ready to go? And do you have a plan for what comes next – a new job lined up or plenty of leads, plus enough money to sustain you during the transition? Give two weeks’ notice. Don’t burn your bridges on the way out. Giving the appropriate amount of notice will ensure that your employer is willing to give you a good reference, should you need one later on. Write a resignation letter. A formal resignation letter is still the best option when you leave a job. It’s good manners, and it prevents any confusion about your last day and other details of your departure. Observe the simple do's and don'ts of resigning. For instance, you'll want to make sure to clean your computer and remove any personal documents before giving notice. It's also best to avoid bad-mouthing your co-workers or manager, or boasting about your next steps. You never know when a prospective employer will conduct a reference check so it's best to leave on as positive a note as possible.